Young readers will relate to these elementary school children playing outside. In first grade, Ana meets Karina, who becomes her best friend. Together, they swing higher and higher as they try to kick the sky! In second grade, Ana and her friends dangle like monkeys, eat pretend bananas and call out, “Ooo, ooo, ooo! Can you do what we do?” As they grow, the kids learn to play new games on the playground: basketball, soccer and even handball. 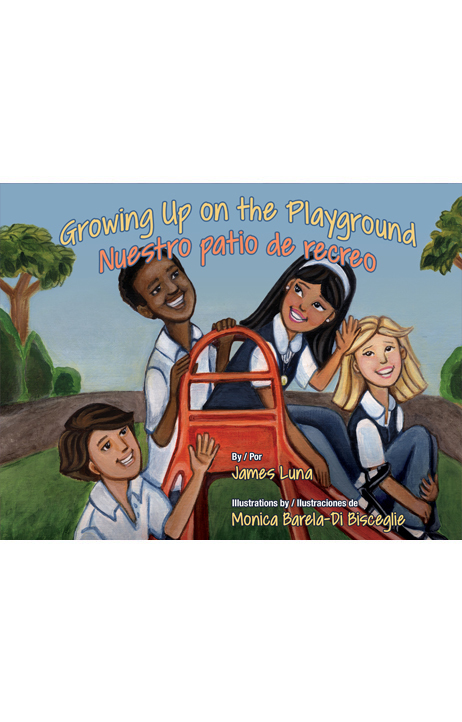 Acclaimed children’s book author James Luna uses short, simple text and active words to depict children at play. They swing and hang, dribble and shoot, pass and kick, laugh and learn. And when they get to sixth grade, they have to say good-bye to their school’s playground. But someday they will return! JAMES LUNA is an elementary school teacher in Riverside, California. He is the author of a short, bilingual novel for intermediate readers, A Mummy in Her Backpack / Una momia en su mochila (Piñata Books, 2012), and two picture books, The Place Where You Live / El lugar donde vives (Piñata Books, 2015) and The Runaway Piggy / El cochinito fugitivo (Piñata Books, 2010), which was selected by Texas schoolchildren as their favorite book on the Tejas Star Reading List. MONICA BARELA-DI BISCEGLIE, an elementary school art teacher, earned her BFA in Studio Painting and Printmaking at the University of Texas at Austin. She is a part-time film production technician in the Albuquerque film industry. She lives in Rio Rancho, New Mexico. This is her first book.